D. Hockney, That's the Way I See It, London, 1993, p. 230, pl. 334 (illustrated in color). New York, André Emmerich Gallery; Glasgow, William Hardie LTD. and Saltaire, 1853 Gallery, David Hockney, Some Very New Paintings, January-November 1993, no. 19 (illustrated). Tokyo, Nishimura Gallery, David Hockney: New Works, November-December 1994, pl. 15, no. 6 (illustrated). One of the best known artists of the twentieth century, David Hockney, is renowned for his prolific production, high level of technical skill, and extreme versatility. His Very New Paintings, a series of twenty-six works emerged while he was working on the stage set of Richard Strauss's opera, Die Frau ohne Schatte, performed at the Royal Opera House in Covent Garden in 1992. During this time, he acquired a heightened sensitivity towards light and space, which he translates here in two-dimensional form. Referring to his interest in nature and, specifically, the terrain of the Southern California landscape, the works reveal an abstracted landscape that evolves throughout the series. By the second half of the series, they become more representational with more specific reference to the landscape. Narrow tortuous roads through a landscape of wilderness and lush vegetation are depicted in his two most important Southern California landscape paintings, Mulholland Drive and Pacific Coast Highway and Santa Monica, and these elements are repeated in his Very New Paintings. Planes and patterns unfold in The Twenty First V.N. Painting creating a cubist-like spatial composition that insinuates a multiplicity of perspectives. The impact of Cubism, and of Picasso's work in particular, has been a constant theme in Hockney's work and elements in this series can be traced back to Picasso's paintings of the 1960s and 70s. The background and foreground emerge forming a surface for smaller details that indicate scale, enabling the viewer to derive an idea of relative size within the picture space. Forms swell with color creating voluminous space in which leaves, bushes, trees, branches, fields of grass, and the Pacific Ocean become apparent. The curtain of the stage is also implied in the cascading red that streaks across the central area of the painting. 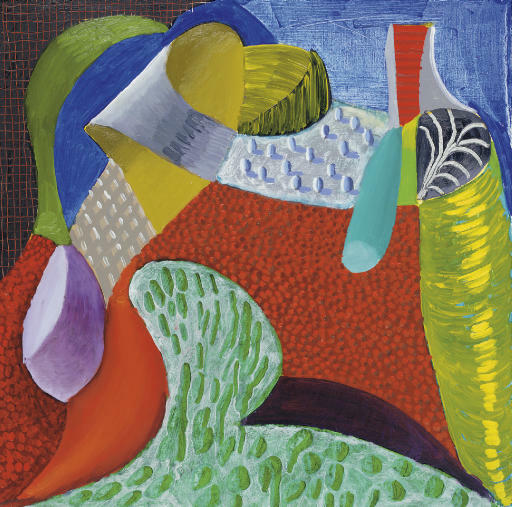 Hockney's meditations on the opera are ever present in the lyrical and undulating shapes, planes and textures. In a conversation with William Hardie, Hockney states that in his process of designing the stage set he "very deliberately tried in the design to find the music as well, the design would be part of the drama-with-characters. There was something big and unifying about it, the set wasn't apart from the music" (quoted in David Hockney: Some Very New Paintings, William Hardie Gallery, Glasgow, August, 1993). Thus, in this work Hockney inserts the operatic within the setting of this complex landscape creating a marriage between the acoustic and the visual.